This is a really cool little project. 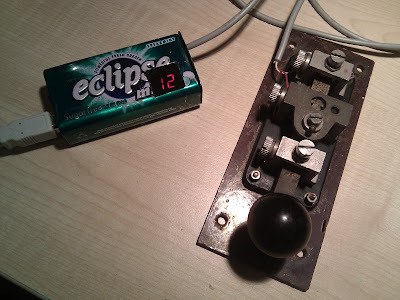 It isn't clear what it does from the picture, but it's a device that makes a Morse key look to a computer like a standard USB keyboard. So you can type into your word processor, blog or whatever by sending Morse. I want one of these. If I had to type all my blog posts using Morse I'm sure I would really get my speed up! Shame it isn't available as a kit. Another glorious day and Olga and I took a picnic lunch up to Watch Hill. We go there not because it is a SOTA summit but because it is near home, a nice walk, not a steep climb (so Olga is happy to come with me) and one of the easiest operating sites for me to reach when I want to get away from all the electronic QRN I'm plagued with at home. Unfortunately there isn't a picnic table up there and I haven't yet found a way to support the MP-1 antenna on a bare hilltop. Using a right-angled PL-259 adapter and a 259 to 3/8 adapter on the back of the FT-817 only works if you have a level surface to put the radio on and no breeze. So despite taking them with me I wasn't able to get any use out of them. No doubt a photo tripod would do the job but that is too much ironmongery for me. I did also take the Intek H-520 Plus and a couple of BNC mounted whip antennas but although there clearly was propagation on 10m I didn't manage to work anything. I did hear something puzzling though. After one call on 29.600 I heard what I'm sure was a native English speaking voice announced something on the lines that this was the EA????? repeater. Unfortunately I'm getting increasingly slow witted these days so I don't remember the exact announcement nor the full call and I didn't hear it again. 29.600 is supposed to be the 10m FM calling frequency and not a repeater output so what could it possibly have been? Back home later in the afternoon and VHFDX.net showed that there was a big Sporadic-E opening on 6m and even 2m in Eastern Europe. I decided to try 10m which seems to be the neglected band and managed to make several contacts including a new country for me, OD5NH in Beirut, Lebanon. 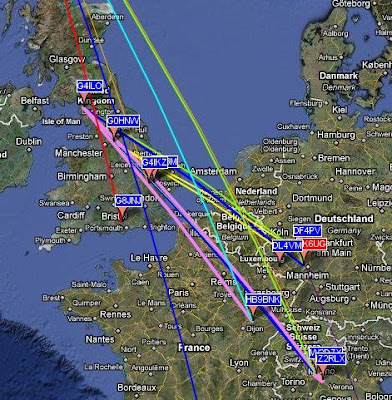 Once again, WSPR is revealing the existence of consistent propagation paths every day on 10m between Iceland (TF), the Faroes (OY) and northern Norway (LA/LB) and the UK and north-west Europe when there is no Sporadic-E and no other propagation except over very short distances between closely located stations. This has occurred even during periods of zero sunspots. I'm guessing that because we have only in the last few weeks had a large number of WSPR monitors on 10m because of the Sporadic-E season, no-one has previously observed it. But I'm surprised at the lack of comment about it. Perhaps this is a phenomena known to everyone but me, in which case I'd welcome some enlightenment. 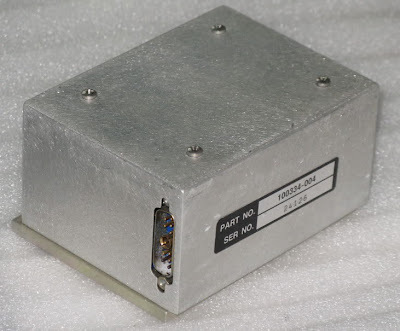 From John Harper AE5X's blog I have discovered that Ten Tec will be re-branding the Chinese HB-1A QRP CW transceiver. The Ten Tec versions aren't exactly the same - they will be selling two versions, one covering 40 and 30 metres and one covering 30 and 20 metres whereas the original covers 40, 30 and 20. This may have something to do with meeting FCC spurious emissions specifications. As it happens, my HB-1A is on eBay at this very moment. Not that there is anything wrong with it, just that it doesn't do anything that my FT-817 can't do and I've spent quite a lot on new radios recently so it seems right to dispose of some of the ones that aren't being used. But its performance wasn't exactly spectacular. It's a bit sad to see the company that made and discontinued the Argonaut 516 HF QRP rig and matching 526 6'n'2 metre rig offering such a basic radio as its only QRP product. I'd love a Ten Tec 516 / 526 pair, so if anyone has one in mint condition that they'd like to sell or trade for an Elecraft K3/100 drop me an email. Computers and radio really don't mix. I was trying to connect the FT-817 to the shack computer. 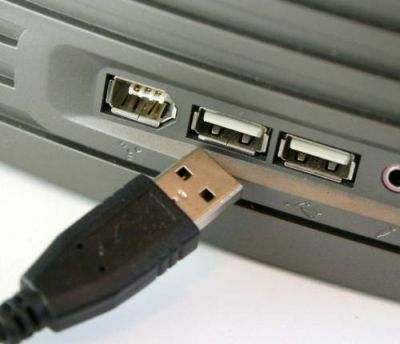 I plugged the USB cables into the back of the PC, then as I lifted the cables vertical to feed them behind the shelf unit I heard the noise level on 2 metres come up quite clearly. I could probably reduce the noise using clip-on ferrites but any more noise than I already have is unwelcome. I think I might give up the computer altogether and go back to paper logging! I also proved today that it isn't possible to work satellites with indoor antennas. Yesterday I tried receiving AO-51 with the 3/4 wave vertical I made, but I got a readable signal for only a few seconds. Today I tried the 6 element Yagi I made a few weeks ago which received signals off the Moon when used outdoors. Pointing it at the satellite from inside the shack I again heard only a few seconds of signal from the satellite. I think there is just too much attenuation at 70cm to use indoor antennas, so satellite operation is out of the question. I could probably combine the 6-element 70cm and the Moxon 2m antenna to make a portable hand held antenna for satellite use. 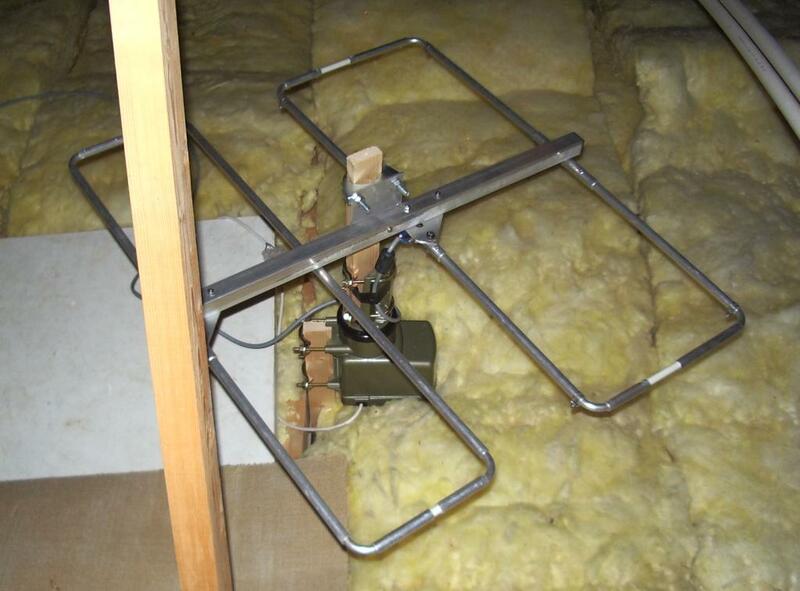 But whilst it would be an interesting challenge to make a satellite contact using the FT-817 and a hand held antenna out of doors I had really hoped to be able to do it from inside the shack. I have been listening when time permits to see whether I can hear - and perhaps even work through - amateur satellites with my attic antennas. Today I caught a couple of passes of Amsat Oscar 7 operating in Mode B.
Oscar 7 is the first and only satellite I have ever worked through. It was launched in 1974 and I used it during the summer of 1975 when I was home from university. In those days I used Oscar 7's Mode A (2m up, 10m down) running 50W from an Icom IC201 with an amplifier to a 5 element Jaybeam and receiving using some kind of wire antenna and a Yaesu FRG-7 receiver. Oscar 7 is more than 35 years old and the fact that it can be used in 2010 is interesting. The satellite failed in 1981 after all the batteries failed short-circuit and that was the last anyone expected to hear of it. But in 2002 its beacon signal was heard once again after one of the batteries went open-circuit allowing the full power from the satellite's solar panels to be used to run the transponders. Jan King, W3GEY, who built Oscar 7 in his garage all those years ago, wrote about his feelings on hearing his 'baby' again - it was clearly an emotional experience. The satellite now comes on when it is in sunlight and goes off when it is in eclipse. It is pot luck which of its modes it uses when it comes on, but it mostly appears to be Mode B, the downlink of which can be heard on 145.950MHz USB plus or minus 20kHz. You can receive it quite well using a good 2m vertical - in fact I hear it better on my Slim Jim than I do on the SuperMoxon due to the fact that the latter is very narrow band and tuned to the low end of the 2m band. I am finding it difficult to find out which of the many amateur satellites now in orbit are usable for communication and when they are actually available. 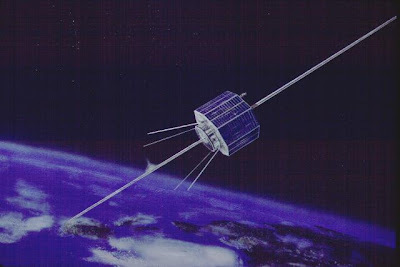 Many of the websites giving information about how to use satellites are well out of date and give details of satellites that are no longer operational. To add to the confusion some sites use names like "Hamsat" or "Echo" while others use the Oscar designation. So you may find the links below useful if you would like to try listening for Oscar 7. N2YO has an excellent site for all satellite enthusiasts which provides real time Oscar 7 satellite tracking and allows you to generate predictions for future passes. It's worth logging in to the site so it can remember your location co-ordinates. You should also tick the box "Check to show ALL passes (visible and not visible)" - confusingly this refers to when the satellite is visible to the naked eye, not when it is above the radio horizon. The Oscar Satellite Status Page lets people enter reports of satellites heard so you can see which ones are operational and get an idea of which mode Oscar 7 is operating in at the moment. Finally Planet Emily has a lot of information about Oscar 7 including a log where people can record contacts made through this antique piece of space hardware. After I removed my Ascot weather station due to the interference it caused on the 70cm band, I didn't have a clock in the shack. I searched for a long time to find a radio controlled digital clock with a nice 24 hour LED display capable of showing UTC but couldn't find anything suitable. Whilst browsing I found something interesting. 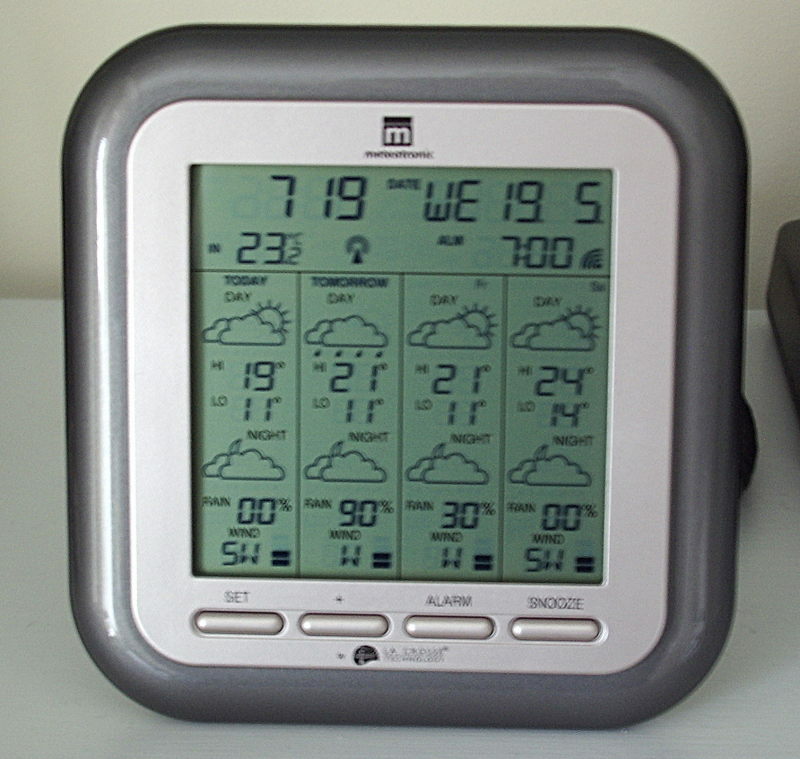 It was a Meteotronic WM5100 weather station made by La Crosse, reduced from £49.99 to £17.49. As I still liked the idea of having a weather display in the shack, I decided to get one. 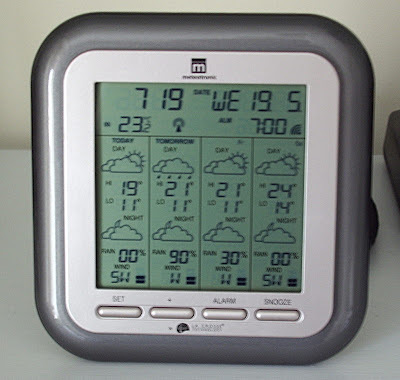 The Meteotronic is interesting as it is not, in itself, a weather station. It is a radio, tuned to receive transmissions from the German time and frequency standard station DCF77 on 77.5kHz. Besides an accurate time signal, DCF77 transmits weather forecast data for 90 different regions of Europe for up to 4 days ahead. This information is received by the device and displayed on its LCD, as you can see in the picture. Some of the weather regions are quite large. I am in the region "northern England" which covers the whole area north of Birmingham to the Scottish border. But the forecasts are probably still better than predictions based simply on atmospheric pressure trends, like most home weather stations. I'm coming to realize that this is a pretty poor location for reception of radio signals of any type. The unit had difficulty receiving the DCF77 transmission, although I am well within the maximum distance at which reception is possible. You need to experiment with different locations to get the best reception. Although the unit doesn't have a UTC time option, you can set a time zone offset, so I can set this to -1 during the summer to compensate for the effect of daylight savings time. This morning there was a lot of Sporadic-E about. I spotted - and was spotted by - several stations on 10 metres. I didn't hear any normal activity on 10, but there was some on 6m and I made a couple of contacts. However the weather was gorgeous, too good to be indoors whatever the propagation, so I took some coffee, a sandwich, the Motorola GP300 and the Intek H-520 Plus and set off to do a couple of Wainwrights. There was a strong, cold south westerly wind so I hunkered down in the stone wind break on the summit to have my lunch. A retired couple over from Newcastle joined me and wanted to chat, so it was not until they had gone that I was able to get the radios out. I put the telescopic 5/8 antenna on the GP300 but the wind was so strong it was blowing it almost horizontal so I switched to the helical. I was using the speaker mic, but no-one replied to my calls and I realized that the rig was not going to transmit. That was the first of my troubles. Dispensing with the speaker mic I called CQ and made contact with Keith G0EMM in Workington. After we moved down to 145.450MHz we were joined by Colin 2E0XSD and Derek 2E0MIX. The guys knew I had recently acquired a 10m FM H-520 hand held and anticipated that I would want to try using it. I decided it was too windy to try the 4 foot antenna so I used instead the short one that came with the rig. As soon as I pressed the PTT the rig shut down and re-started. Keith suggested there might be something wrong with the batteries, and that seemed to be the case as when I reduced power to 1 watt the rig didn't shut down but the battery state indicator went from all bars to no bars. So that was the second of my troubles. As per usual, I had my digital camera with me to try to take a picture, using the self timer, of me at the summit. But either I got only my legs, or only my head, or the wind moved the camera so the picture was blurred. After that, every picture I took with the timer was grossly over-exposed (although if I took a picture manually it was alright.) That was the third of my troubles, as a consequence of which you are spared a picture of G4ILO this post. 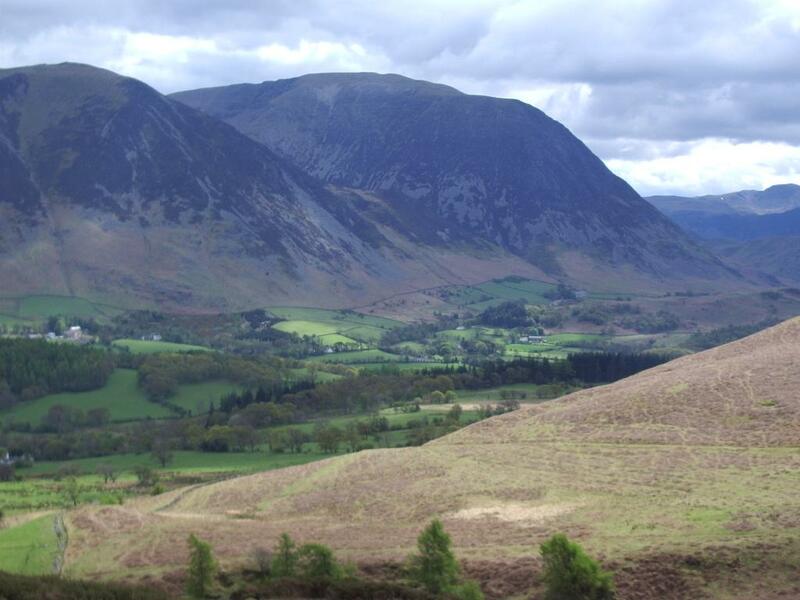 After that I set off for what I thought was Burnbank Fell (WOTA LDW-183). My target was a prominent summit with a large stone summit cairn, about 100m lower than Blake Fell. I reached it in about 20 minutes, put out another CQ call and was contacted by Keith and Colin. They had been tracking my position using APRS and informed me that it looked as if I was on Carling Knott. I was sure I wasn't, as there is no other Wainwright summit in the area. 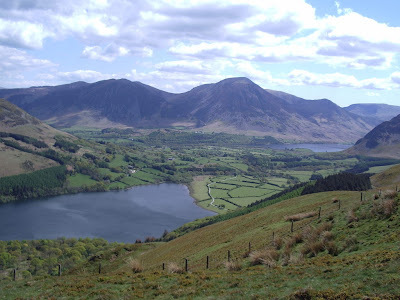 Carling Knott isn't a Wainwright, and the one I was on looked like a pretty important top that I'm sure Wainwright would have given a page in his Guide to the Western Fells. Back at the shack I found there was nothing wrong with the H-520's batteries, but it doesn't seem to like the short whip antenna, which of course I never tested it with before I went out. If I had been able to use the four footer it would probably have been fine. The GP300 worked perfectly with the speaker mic, and I couldn't reproduce the problem with the camera self-timer either. As for activating the wrong fell - I guess I should look at the map a bit more closely. But it was still a gorgeous day and a wonderful walk, even if it was a bit windy and Murphy was my invisible companion. One of the blogs I regularly read is that of Larry W2LJ. Larry has been watching some of the streamed video presentations about software defined radio (SDR) coming out of Dayton and believes that SDR is now mainstream and the shape of things to come. I would be dishonest if I said that I have never looked at some of the SDR products and wished that I had one to try. SDR is becoming an itch that many of us would like to scratch. But I suspect that, in my case at least, it is an itch that once scratched would go away. Although I'm sure that software defined radio technology will find increasing use in tomorrow's radios - as it already does in the Elecraft K3 - I hope that "black boxes" controlled via a computer console never completely usurp standalone hardware radios. Dedicated hardware "just works". General purpose computers are just too much hassle. There are the security issues, the updates, the driver incompatibilities, the crashes, the unfathomable problems. You switch on a radio and it is ready to use. You switch on an SDR and you must then start the computer and wait for it to boot, then start the SDR application and wait for it to load. Is this progress? Dedicated hardware works until it dies. Computer based devices only work until a new version of Windows comes out that doesn't support it. How many perfectly good printers and scanners have you had to throw away because they wouldn't work with your new computer? Real radios have an aesthetic and provide a sensory experience that simply cannot be matched by a computer interface. Isn't turning a knob preferable to moving a slider with a mouse? Isn't making a real audio cable easier than trying to configure a virtual one? Many of us prefer a real S-meter to a graphical simulation. Most of us spend far too much time staring at computer screens already. With real radios you can look at the schematic and get in there with your soldering iron and make modifications or fix faults. With SDR you are dependent on somebody else unless you are a skilled programmer and have access to the source code and development tools. I can't see myself swapping any of my radios for a black box and a computer application interface any time soon. I'll still work the same bands and the same modes, so what benefits would an SDR give me? A hardware radio is instant-on, intuitive, virus-proof and crash-proof, can't be broken by some application I install on my PC, doesn't lock me into using a particular brand of operating system and won't be made obsolete by the next version. I attempted this morning to make a 5/8 wave ground plane antenna for 70cm out of some solid copper mains cable and a chassis mount SO-239 connector. I tried two designs for the radiating element with a coil at the bottom, but both gave "High SWR" from the FT-817 and were so far away from a match that there seemed no hope of getting anywhere. My SWR analyzer doesn't go above 200MHz so that wasn't any help in finding out what was wrong. After these abortive attempts I decided to straighten out the coil and make a 3/4 wave ground plane instead. This gave a perfect match with barely perceptible reflected power being shown on the SWR meter. The four radials are each 165mm (6.5in.) long and the vertical element 483mm (19in.) The radials need to be horizontal for the best match, not slanting down as they usually are for a quarter wave vertical. Hopefully I will be able to receive satellite downlinks with this. There are no 70cm repeaters in this area and no 70cm activity that I know of so it will not be much use for anything else. British and European hams who are in the US to visit the Dayton Hamfest may find it a bit tricky to get back next week. 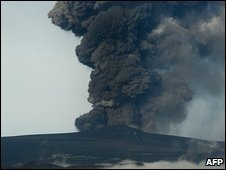 Changing weather conditions are likely to cause ash clouds from the Eyjafjallajokull volcano to return to the UK. The Department of Transport is predicting that UK airspace - including the busiest airports in the south east of the country - may be closed from Sunday until Tuesday. Travellers are advised to check with their airlines before setting off for the airport. My reason for getting the Intek H-520 Plus hand-held was to try to work some Sporadic-E DX from the great outdoors. I didn't think the supplied 18cm whip would be much good for that so I looked for the longest 10m BNC whip antenna possible. The best I could find was the AT-10 with a 4 foot telescopic whip which I believe is made by Sandpiper Antennas in Wales. It is sold by Waters and Stanton. I ordered one yesterday and it arrived in the post this morning - nice to see they can get it right sometimes. The first thing I did with the antenna was put it on my AA-200 antenna analyzer. I was dismayed to find that the SWR on 10m was more than 10:1 and the best match was around 38MHz. I anticipated that this would be going straight back. However the instruction sheet "Getting the best out of your antenna" recommends using it with a counterpoise. I had expected to use one for best performance anyway, so I decided to try this before writing the antenna off completely. The instruction sheet recommends a length of 6ft 5in for 10 metres, but I found that was too short as the best match was still well above 30MHz. By trial and error I eventually found a length of 7ft 6in was about right. The best SWR was still only 2:1 so I think the antenna is capable of improvement, but there is nothing else available to the best of my knowledge. Now I just need some Sporadic-E to see how far it is possible to work with a hand held radio. As some of you know, I'm a bit of a sucker for hand-held radios. Whilst browsing eBay I'd often come across the Intek H-520 Plus CB hand-held and thought what a nice looking rig it was and wouldn't it be nice if it could be converted to amateur 10m usage. A couple of days ago I stumbled across a site that gave the details of how to convert it for amateur 10m use so I decided to order one. It arrived this morning. Never has a radio been taken apart so soon after its arrival. (Real hams don't care about warranties!) Unfortunately, no matter how hard I tried, I couldn't find again the site that had the modification information, but I vaguely remembered the details. 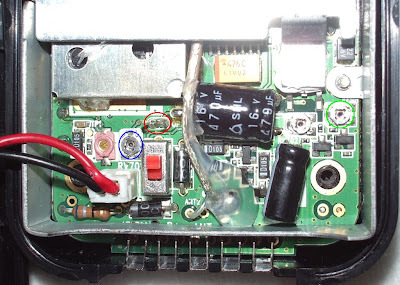 Beneath the battery compartment there is a loop of wire. Snip it and push the ends apart. I'm not sure what that does. Now put the batteries back in and turn on the radio whilst depressing the Menu button. You can then select the option "Po" by pressing the down arrow button. Press Menu again, then press and hold the up arrow button until the frequencies displayed are in the 29MHz region. You now have a 10m FM / AM hand held. Whilst I was doing this I was WSPRing on 10m and I saw some very strong traces from stations in Germany indicating that there was short-skip Sporadic-E on 10m. Were conditions such that I would actually be able to make some contacts with the new radio today? The antenna supplied with the Intek H-520 Plus is about 15cm long so I suspect it will be less than useless for making any DX contacts. Clearly what I need in order to use this as a portable radio is some kind of long BNC 10m antenna, but at the moment I don't have one. The H-520 comes with a "car kit" which screws to the bottom of the radio and allows you to power it from an external supply and connect an antenna with a PL-259 plug. So I hooked it up to the shack supply and the attic dipole. I tuned around and there seemed to be things going on, so I found a clear frequency, 29.520MHz, and called CQ. After a few seconds jack PE1JRP called CQ on the same frequency. I called him and we made contact. He found my signal was up and down, as I did his, but he gave me a 53 report. He said that Leo PA3ELQ was waiting on the frequency and he then called, for my second contact. My report in this case was 57. They were both pretty impressed with my signal running - as I thought - 4W output. I decided to check the H-520 Plus on my power meter and found that, far from putting out the advertised 4 watts, it was only radiating a whisker over 2. I took it down to the CB channels and even there it was giving barely 3W output. I also recalled that the web page that I could no longer find mentioned the need to turn up the deviation for 10 FM use. I managed to locate and download a service manual for the H-520 Pro and this gave a procedure for adjusting the power. I had to turn the power control pot all the way up and I still only got about 3.6W on battery power (and just about 4W when running from the car adapter.) That's good enough, though. From the block diagram I also was able to identify the FM modulation pot and turned that up a bit, though neither of the Dutch stations had complained about my audio. In the picture above, the red circle shows the wire loop that you cut, the green circle shows the power out pot and the blue circle the modulation control. With the radio back together I hooked it up to the dipole again and worked Oliver DH5PK, receiving a 53 report. I am quite happy with my three contacts considering that I only opened the box after lunch and the radio spent much of the time disassembled. I saw from VHFDX.info that there was a great opening on 6 metres at the same time, but making contacts with less than 4W of FM is more challenging. What I'm hoping, of course, is that I can make some contacts like this using the H-520 Plus as a hand held radio with a whip antenna! There is speculation at the moment about whether Icom will release the new IC-9100 top band to 23cm transceiver at Dayton, and what the price will be. I wish someone could tell me why there is this trend towards do-everything shack-in-a-box radios instead of separate VHF/UHF rigs like the now discontinued IC-910H which I just bought? One of the reasons I switched from using a transverter to having a separate rig for VHF is that I can't use HF and VHF at the same time. An all-in-one radio would have just the same limitation. Just because technology makes it possible to cram everything into one box doesn't mean that there is no longer a reason to have separate radios. 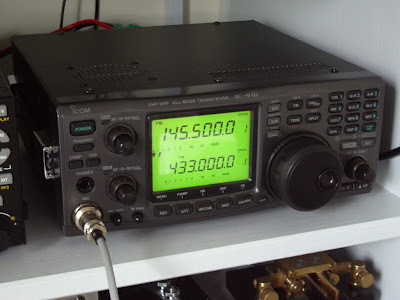 If you want a new multimode radio for 2m or 70cm you have to buy an FT-817, FT-857, FT-897 or TS-2000 - which are all compromise rigs with fairly poor performance - or wait for the IC-9100. No wonder good single VHF band multimode rigs like the IC-275H are now worth their weight in gold bullion. I phoned up Radioworld this afternoon to ask why I hadn't received the 2m 5/8 vertical I ordered a week ago. After looking up the order the girl told me that the stock hadn't come in yet. "We sent you an email yesterday" she said. That was presumably in response to my shirty enquiry yesterday. I checked through my Spam folder and I didn't receive any email from Radioworld. I mentioned twice that I had received an email saying the item was despatched on the day I ordered it, but there wasn't the slightest hint of an apology, just a repetition of the fact that the stock hadn't come in yet. Radioworld goes on my list of dealers to avoid. LAM Communications by contrast has been a pleasure to deal with. After failing to win any VHF multimodes on eBay I decided that rather than gamble my money on the stock markets or leave it in the back at an almost zero rate of interest I might as well buy any radio gear I want, so I treated myself to an Icom IC-901H. LAM had a used one for sale so I phoned up to ask about it. I was told it was in really nice condition but when I asked its age the salesman (Dave) didn't know, so he promised to phone Icom UK to find out when the guarantee ran out and call me back. This he did after a few hours. He was a bit apologetic, saying that it was made in 2003 so there was "a bit of age behind it" and in view of that he would knock an extra £50 off the price and throw in carriage for free. I decided to go for it and he then warned me that the FedEx courier had already called so it wouldn't go out until the following day. Fine, so it would arrive today. It did, well-packed (the Icom box was bubble wrapped and inside a larger box) and was exactly as described. Better, in fact, I can't see a single mark on it. I am well pleased, and would be more than happy to buy from LAM Communications again. The screengrab below, from WSPR at 0815 this morning, shows just how selective Sporadic-E propagation can be. 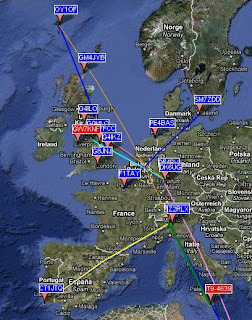 For a change, G4ILO is hearing and being heard by all the European stations while those in the south of England aren't getting anything. Look, too, at all those lines going off the top of the map to OY1OF. I wish I could understand the propagation. It appears that if you like the 10m band, the best place to live is the Faroe Islands! 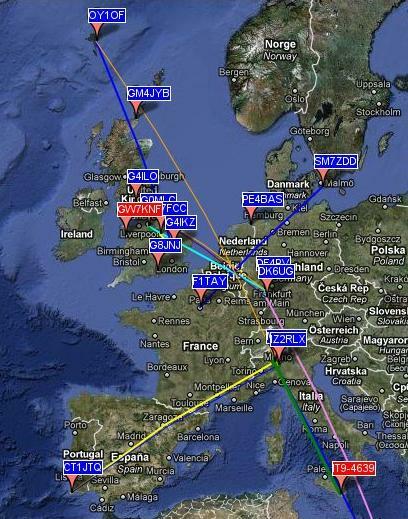 For the last week or so I have been using the K3 for WSPR on 10m to detect the signs of any Sporadic-E openings. Since the opening of May 3rd there has been nothing very exciting to report, though it has been interesting to see spots of stations previously never heard suddenly appear, often at good strength, as a patch of ionization materializes in just the right place. What has been intriguing over the last few days is the consistent appearance of spots involving OY1OF throughout the day, often with stations in the UK but also with those in Holland, France or Germany. Could it be scatter from the ash of the Icelandic volcano? The objective of today's walk was Fellbarrow, a minor Wainwright fell WOTA number LDW-199 in the North Western Fells. It had never been activated before and I thought it would be an easy walk, so off I went. I set off along the lane that goes behind Whin Fell. By a field gate I was checking the map to see if this was where I turned off the lane to go up on to the fells, and someone walked by and asked if I was lost. I said I was just checking to see if this was the way to Fellbarrow and he said yes, you can go that way, so I did. After about 15 or 20 minutes of walking I found that I was at the far end of a large field surrounded by a dry stone wall with barbed wire on either side and no way I could see to go any further. Eventually I did find a place where the wall had fallen down and it was possible to negotiate the barbed wire, only tearing my walking trousers a little bit. I carried on but found the directions I thought I needed to go blocked by walls and gates. The trouble with these grassy minor fells is that they don't look very distinctive so they aren't obvious targets to aim for, and they are infrequently walked so there is no obvious path to follow. Basically, I was lost. APRSISCE on my mobile phone was no help as the mapping it uses contains no topographical detail at all. I tried Google Maps but it informed me that there was no network coverage so it couldn't download any maps. I plodded on until I saw a path that descended into the valley and I decided to stop, have my lunch and go back. After lunch I decided I would follow some tyre tracks up hill just to see where they went. After about 5 minutes I saw a stile in the fence and a path. I followed this and after a couple more stiles found myself on the top of Fellbarrow with its Ordnance Survey trig point. I got out the Motorola GP300, made a couple of calls on 145.500 FM and was answered by Colin 2E0XSD. However despite a take-off that covered Whitehaven, the Isle of Man, Workington, Cockermouth and the Dumfries and Galloway area of Scotland I got no other responses. I checked the repeaters and heard Richard MI6BJG/P putting a call into the GB3GI repeater. He was walking into Belfast with a hand held radio and we had a chat for a few minutes until he started dropping out of the repeater. I also heard a repeater GB3BT on the channel marked for GB3EV, which I later found is at Berwick on the north-east coast. I still couldn't raise anyone on FM simplex, so I decided to come back. The return route was a bit easier and used the path I should have taken if I had walked for another 5 minutes beyond the point that I was misdirected. I think I need GPS software with OS maps on my HTC Touch. 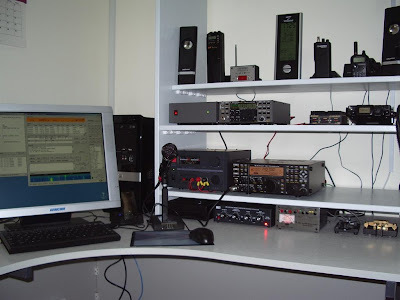 A recent discussion on the WSPRnet website concerns whether one should log WSPR contacts. It was pointed out that normal WSPR "spots" are not contacts. However it appears that some operators consider that if two stations spot each others' signals within a short interval of time then they treat it as a contact and QSL it. In my opinion WSPR spots, even if they occur both ways within a short time, are not contacts because you have no way of knowing if someone else received your transmission (or what signal report you got) without using the internet. It would be nice if the WSPR protocol provided a way to discover who is hearing your signals without using the internet but it doesn't. I have no issue with QSLing WSPR "spots" as SWL reports. But they are not contacts, and if anyone uses eQSL to send a QSL to me for a WSPR spot it will be rejected as "not in log." Today I replaced the home made 2m Moxon Rectangle with a Vine Antennas SuperMoxon. As you can see from the picture of it installed in my attic it is a Moxon Rectangle with two directors that are also folded into a rectangle. My attic, like my house, is very small. As is usual with modern British houses, the roof trusses are made of thin wood with cross-bracing for strength, so the attic area isn't open to allow the free rotation of antennas. I have crammed rather a lot of antennas into this space to try to cover the maximum number of bands, so the VHF antennas have been forced into odd corners. Using a conventional small beam is not possible as there is insufficient space to allow rotation. Vine Antennas claim that no other antenna gives so much gain in such a small turning circle, so it seemed like an ideal design for this situation. They claim that the directors add an extra 3dB of gain to the Moxon Rectangle design - about 9dBi which is more than a three element Yagi. The antenna was quite expensive to buy. It is quite rugged and heavy but looks a bit home made. While the driven element and reflector made use of Jubilee clamps to tighten the main elements on to the smaller tubing used to form the corners, the directors used self tapping screws which had worked loose in transit (and probably would work loose in use due to wind vibration) and which stripped the inner hole when I tried to tighten them. You are left to your own devices to find a way to weather proof the feeder connection. Since my antenna is going to live a cosseted life away from the wind and rain I was not bothered by these issues. The antenna presents a 50 ohm load but needs a balun to prevent feeder radiation. Vine Antennas offers a choke balun (apparently several turns of coaxial cable held in a loop using cable ties) for an extra £15. I decided to do without this, but I placed a clamp-on RFI ferrite over the cable close to the feed point which will hopefully achieve the same result. The SWR is almost 1.0:1 at 144.0 MHz, as the plot from my AA-200 antenna analyzer shows, but it rises steeply to 1.4:1 at 144.4MHz and 2:1 at 144.8MHz. Clearly I had better not use this antenna to work satellites. This antenna is probably as good as I am going to get given the restricted space available. 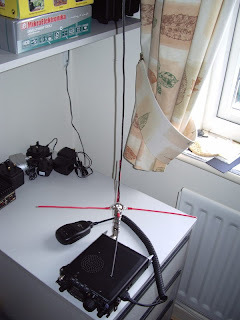 The SuperMoxon design is copyright Vine Antennas and commercial reproduction is prohibited, which should be borne in mind if you try to make your own version. Several years ago Olga and I considered moving to Bulgaria. The idea is not as far-fetched as it might seem. Olga is from Eastern Europe and had visited Bulgaria before. She speaks Russian, which many Bulgarians can speak too. Her niece was married to a Bulgarian and living in the country. Property programs on TV like "A Place In The Sun" were promoting Bulgaria as "the new Spain" where property was cheap and huge investment gains could be made, and lots of other Brits were buying out there. So we booked a trip to visit Olga's niece and see for ourselves. 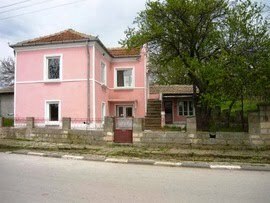 We didn't in the end decide to buy a Bulgarian property. We saw some nice houses, much larger than our shoe-box on its postage stamp plot here. The countryside was beautiful and unspoiled. But we found Bulgaria to be a poor country with poor infrastructure. As elsewhere in the former Soviet bloc we got the feeling that a few people were making huge amounts of money but very little of it was trickling down to improve the lives of the general population. I'm one of those people who feels that quality of life is not just about what you own, but also your surroundings and the well-being of the people who live around you. I decided that I couldn't see myself living there. I forgot about Bulgaria, but real estate agents continued to send Olga information on new properties and she recently started mentioning some of the bargains to be had there. Back in 2004 I felt that interest from British property investors had driven prices to levels that were unreasonably high, all things being considered, but prices appear to have fallen since then and property is amazingly cheap now. The house shown in the picture - 90 sq. m on a plot of 780 sq. m, and newly renovated - could be purchased for just 13,000 Euros (about £12,000 or $18,000 US.) If you are up to a bit of DIY there are properties that are even cheaper! As Britain seems about to embark on a period of high taxes and austerity, with a government led by the Conservatives who lack experience and frankly make me nervous, the idea of moving to Bulgaria seems once again to be rather attractive. From a ham radio point of view there would be benefits too. There was an article a year or so ago in one of the magazines about Acom amplifiers (which are manufactured there) in which the chief engineer was quoted as saying: "Come to Bulgaria. You don't need planning permission for antennas here." I just got round to checking the Sport Radio page of the May RadCom so as to transfer to my wall calendar the dates and details of any contests I might be interested in making some contacts in this month. I happened to notice that the exchange for the 144MHz Contest on 15/16 May is RS(T), serial number, grid locator and post code. Post Code??? What's the point of that? And what if you are operating portable from a hill somewhere and don't have a post code? Daft idea if ever I saw one. I'm not paranoid, but I think everyone is out to get me! 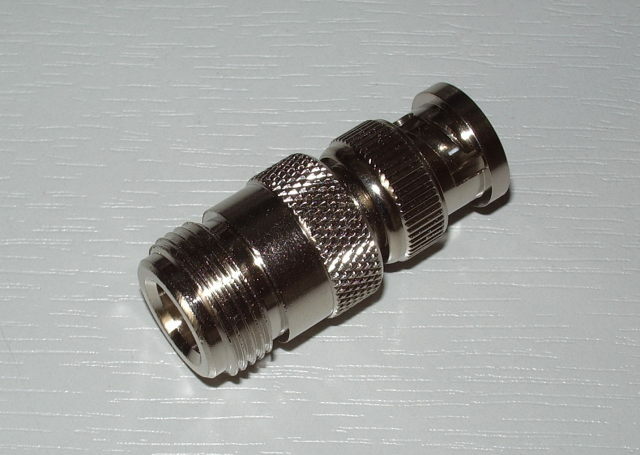 I ordered some connectors from eBay seller m0jpm and, because I have been thinking about getting a radio that has N type connectors on it, I decided to order a couple of BNC to N-type adapters so I could use the much easier to obtain BNC plugs on my antenna cables. The listing I ordered from is shown below. The package arrived this morning and when I opened it, to my dismay I found that the adapters were the reverse of what I wanted. As you can see, they are for attaching N-type plugs to BNC sockets. It has sometimes happened that I ordered the wrong thing by mistake, so I was relieved when I checked the eBay listing and saw that this time it was the seller's mistake not mine. But my relief turned to anger when I emailed the seller to inform him of the error and received the reply: Dear g4ilo, Hi we have send you what you have ordered, as this is the only n-type to bnc we have listed. but if you not happy send it back for a refund. Is it really necessary to insult my intelligence by telling me "we have send (sic) you what you have ordered"? I will send the adapters back for a refund (and no doubt be out of pocket for the postage) because they are no use to me. But I shan't be buying anything from m0jpm again. In a comment to my previous post Ricardo CT2GQV said that I should give up buying on the Internet. I wish I could, but if I did I would have to give up the hobby because it is not possible to buy radio stuff round here. A few weeks ago I set up an experimental low power EchoLink node for use as a personal EchoLink "hot spot" using my FT-817 and a dummy load. I planned to make a a dedicated transceiver / computer interface for this. 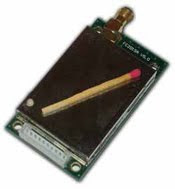 I thought I found the ideal basis for the project in this UHF Micro Transceiver Module from Elcom Research, a Greek company that makes packet radio and APRS products. 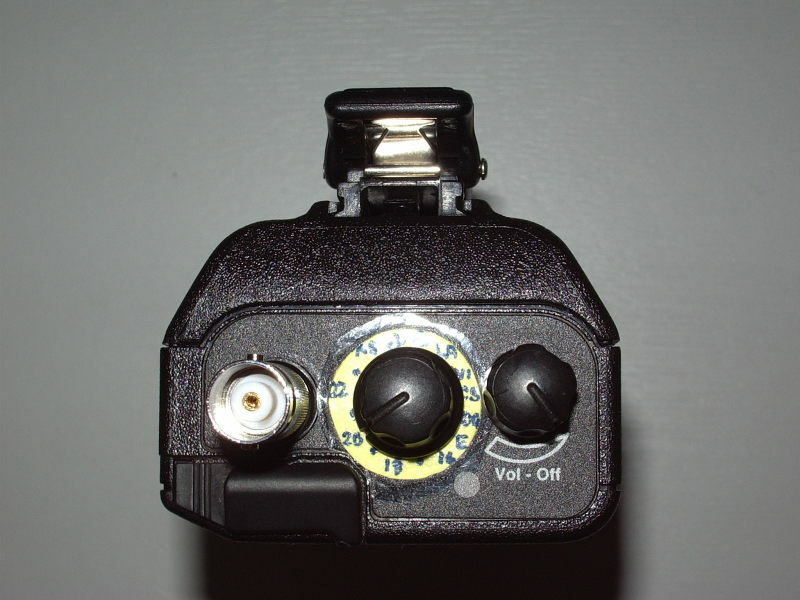 The transceiver runs on 5V and can be powered by a computer USB port. Perhaps I should have been warned off by the fact that an enquiry made through the web form on the Elcom site went unanswered, but I went ahead and ordered the module on 9th April, paying online using PayPal. After a couple of weeks nothing had been received, so I sent an email enquiry and received a reply that it had been sent by air mail and should be with me by the end of the week or the beginning of the next one. This was during the flying hiatus caused by the Icelandic volcano, so I gave it a bit longer. However it is now a week after the week that the module should have been received at the beginning of, and a further email received no answer at all. It looks unlikely that I will receive the module at all, so I guess my only option is to initiate the PayPal disputes procedure. Not much happening today. 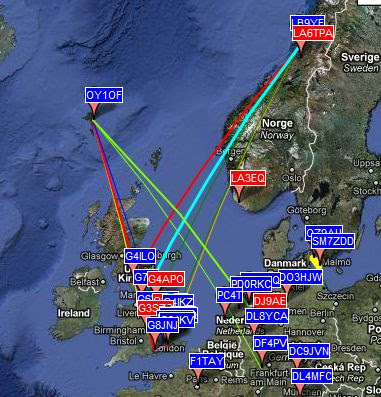 I have been WSPRing on 10m with 5W but heard nothing and have been spotted just once - by OY1OF on the Faroe Islands. Yesterday evening I was receiving EA4SG in Spain but he was running 20W. I upped my power to a similar level, and was spotted by G0HNW and M1AVV in the early evening. I left the system running all evening but after it was dark I noticed my neighbour's security lights were coming on at the start of my WSPR transmissions. Not good when you are trying to maintain a "stealth" station! Before I started with WSPR today I got out the old DOS laptop and the Motorola programming software to make a few changes to my GP300 configuration. I reduced the squelch threshold slightly, reduced the power from 6W to 5W which should help the battery endurance more than it will affect reception of my signals, and I programmed the radio for 16 channels. Now there are 16 channels it's difficult to remember what they all are so I made a paper scale to go under the tuning knob which shows the 2m channel numbers or repeater calls. I had to use the magnifying headset to do the very small lettering and I can only read the scale with my reading glasses on - which I don't when I'm out and about. But I couldn't read the channel numbers on the original dial scale either so I'm not actually any worse off. I used to have great eyesight - this is what happens after spending most of your life in front of a computer! I spent the morning building this constant current charging circuit on to the circuit board of the junk Motorola charger I bought on eBay. I also made a power lead so that it is powered by my K2 power supply, eliminating the need for yet another wall-wart. 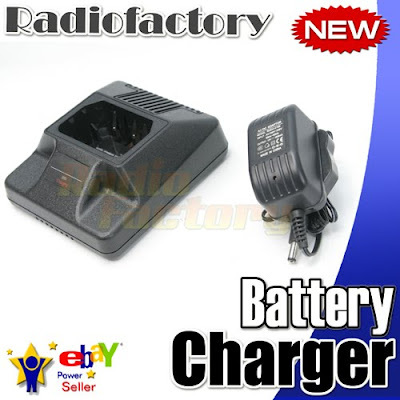 The charger was supplied with a UK type switched mode power supply rated at 12V 1000mA. In view of the "quality" of the charger itself it is unlikely that I would want to use the wall-wart that came with it for anything, but surprisingly when I tested it I couldn't find any obvious interference. As I have said before, the electrical noise level here is so high that something would have to be pretty bad for me to notice it, but that was a device which I expected to be pretty bad. As I was checking the bands for new unwanted noises I heard a CW signal on the 6m band. That turned out to be EB1EHO, whom I worked for my first Sporadic-E contact of the year. 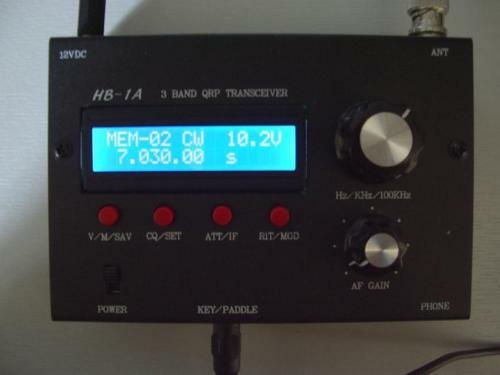 I spent an hour or so on the band and worked several stations on the west coast of Spain and one in Portugal, CT1ANO. As you can see from the DX Sherlock map, the reflective Sporadic-E cloud appeared to be located somewhere over South Wales. I did hear a Scottish station working EA6/M0DLL on the island of Menorca. The DX was right down in the noise and not copyable on my dipole but might have been workable if I had a beam. So clearly there was Sporadic-E about elsewhere. This opening was a nice treat for a Bank Holiday and I hope is an indicator of things to come this year. I've bought loads of radio and electronic stuff from Hong Kong and China on eBay and most of it has been okay. But I've had the occasional duff purchase, like the stubby dual band antenna allegedly made by Diamond which I'm pretty sure was a fake. I bought a Motorola GP300 radio body at the Blackpool rally a couple of weeks ago but I needed accessories like a battery pack, charger and speaker mic. Ebay was the obvious place to look for them. The 1800mAH NiMH battery pack was fine, and a good price. The speaker mic is obviously a clone of the original Motorola design but a lot less solidly made, but I have received good audio reports using it so no complaints there. However I was a bit suspicious about the "overnight charger" purchased from RadioFactory because after 6 hours of charging the battery pack was really hot. The GP300 battery ran out while I was on Watch Hill this afternoon so I need to charge it back up, but before I do I thought I would take a look inside. The case is conveniently designed so that you can pull it apart after pushing back four flexible plastic clips. The circuit board then just lifts out. I got quite a surprise after I did! 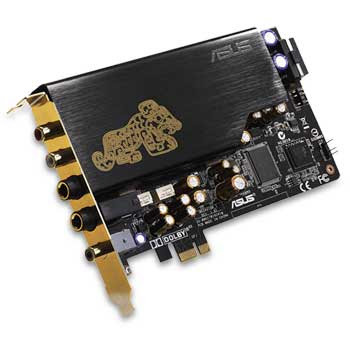 The top of the circuit board is printed with component outlines but most of the components marked are not present, and many of the components that are there don't correspond with the outlines. In the middle of the board is an unidentified component that looks as if it has overheated. 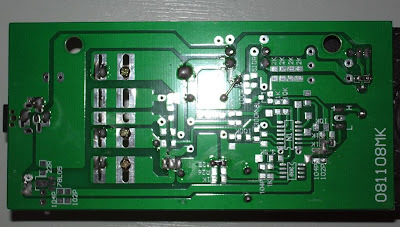 On the underside of the board, again, most of the components that are supposed to be there are missing. Some of the tracks are bridged together with solder blobs or a wire link. I haven't got the time or, more importantly, the clarity of mind to work out exactly what the circuit on the board actually is, but it doesn't look much like something capable of charging a 7.2V battery pack from a 12V wall wart. I'm not quite sure what to do about this. I have the plastic case and the charger contacts, which as I know from the charger I made for the TH-205E are the hardest parts of a battery charger to make. So I could simply make up another constant current charger circuit on Veroboard and put it into the existing case. Or I could simply cut my losses and buy another Motorola charger from a reputable source. I'm sure that one of my readers will know of one. It was a fine sunny morning. I remembered - having worked a couple of activators yesterday - that it was the Summits On The Air (SOTA) Activity Weekend, so I thought we would go to Watch Hill, G/LD-054, and see what I could work from there. Compared to all the people who have slogged up thousands of feet to get to their summits Watch Hill is a bit of a cheat. It's a 15 minute stroll from the nearest car park, with only the last couple of hundred metres being a bit steep. But as it is a less than 10 minute drive from home it's a popular walk for Olga and I and we often take a picnic lunch up there. I took with me the Motorola GP300 and the Kenwood TH-205E with the 5/8 telescopic whip. Getting the 4 contacts required for a SOTA activation can be a challenge from there, as it is a fairly low hill and there isn't a huge amount of 2m FM activity round here. Many have tried and gone away disappointed. However on Sunday morning the Workington Radio Club has a 2m FM net. I broke into that and soon had 5 contacts logged. Future would-be activators of Watch Hill please note. 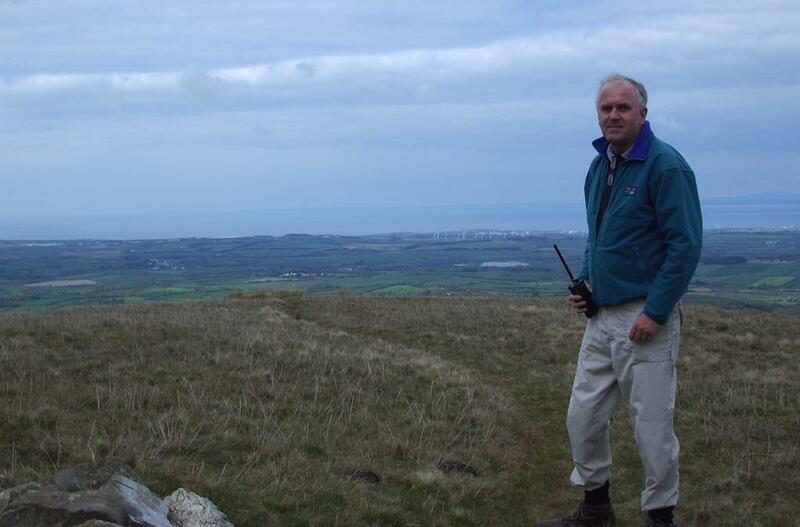 I also made a summit to summit with 2M0NCM/P on Lamachan Hill SS-061 in Dumfries and Galloway, and then caught Geoff G4WHA/P who was just stopping for lunch on Wether Hill, WOTA summit LDW-103. I wouldn't have heard him from home, so that was a nice WOTA chaser point for me. 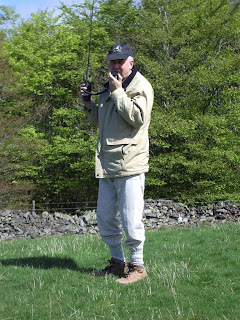 The Motorola produced great, loud audio which is ideal for listening on a windy hill-top, and I got an unsolicited report of "BBC quality" audio on my transmissions, so it seems to be working well. However I noticed that some stations seemed to chop up a bit. I'm not sure if they were weak and the squelch is very sharp or whether their deviation is a bit wide for the Motorola IF filters. I will need to investigate this further. The TH-205E came in handy after the Motorola gave a few beeps to warn, I think, that the battery was exhausted. There is no visual indication of battery state on the Motorola so I had no advance warning. The station I was working said that he could hear a carrier but no audio after the battery went. Still, it does seem to be a nice radio and rugged enough for this type of use. I finally completed phase 1 of the shack renovation. G4ILO is back on the air! The floor is now covered in wood laminate, and there is a shelf unit on the desk that displays all my radio equipment "ready to go". On the "ground floor" is the VHF antenna rotator, the MFJ noise canceling unit, the tuner for the MFJ magnetic loop and my two Morse keys. On the next level is my Diamond GSV3000 power supply and my Elecraft K3. There is space for a new addition to the right of the K3. 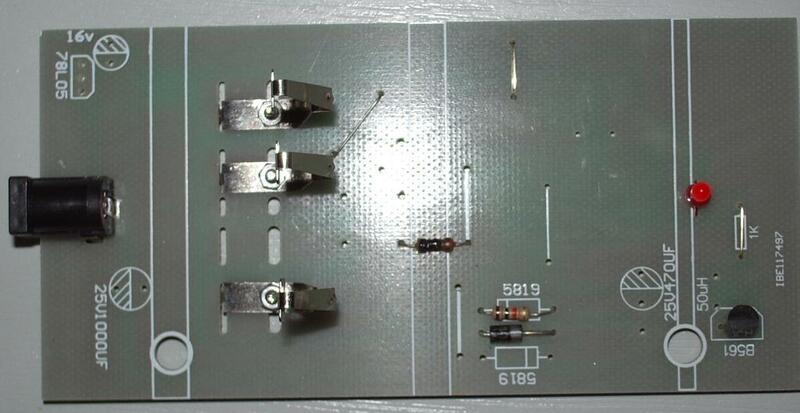 This will not be a P3 panadapter, the pictures of which haven't excited me at all, nor will it be the recently announced Elecraft 500W linear amplifier - as if I could use one with my attic antennas! The shelves above the K3 lift out to make it easier to access the back of the radio for changing cables. On the second storey is my QRP K2 with its matching power supply. The K2 is really there just for display, as it isn't actually connected to any antennas, though I could easily swap an antenna from the K3 to the K2 if I wanted to. The K2 power supply runs a few other items including the FT-817ND, seen on the right with the Microset R50 144MHz amplifier. The 817 is doing duty as my 2m rig at the moment - I have given up the transverter due to a number of issues including poor memory ergonomics of the K3 and the fact that it is convenient to be able to monitor or even operate on 2m while the K3 is otherwise occupied. The top shelf holds the Medion computer speakers that deliver decent-sounding audio out of the K3, my KK7UQ PSK IMD Meter and my collection of VHF/UHF hand-held radios and their chargers. The opposite wall is still a hodge-podge of shelves screwed to the wall. Phase 2 is to install a custom designed system of shelves and cupboards so the boxes of "junk" can be hidden away behind closed doors. There is a firm that has a web site where you can design your own unit from standard modules and it arrives as a giant flat pack which you assemble. Olga is designing it as she is much better at that sort of thing than me. I'm not very skilled at joinery and my home made shelf unit doesn't look all that professional but it's better than what I had. Having all (well, most of) my radios at my fingertips I feel for the first time in my life like I have an actual radio station. I made a few contacts today including a PSK31 QSO with Greece on 12m, two SOTA stations on VHF and a nice slow morse contact with Helge, LA1PRA on 80m.